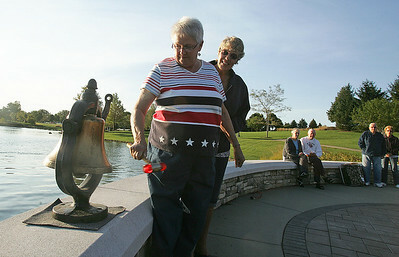 Residents took part in a variety of ceremonies across McHenry County Tuesday, September 11, 2012 in remembrance of the 9/11 attack. 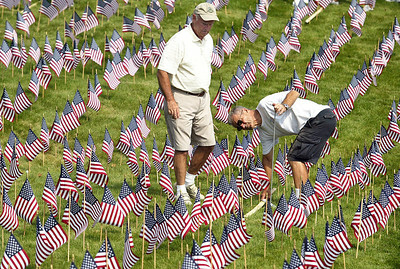 H. Rick Bamman -hbamman@shawmedia.com Sun City of Huntley residents Bob Wold (left) and Chuck Czochara (cq) plant flags Friday, September 7, 2012 for the 9/11 American Flag Memorial. 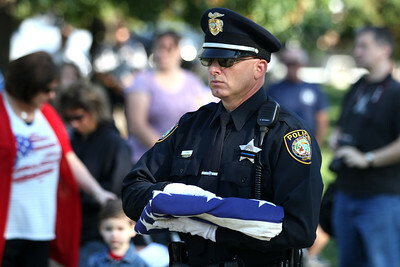 Mike Greene - mgreene@shawmedia.com McHenry Police Department Chief of Police John Jones, speaks during a 9/11 ceremony at Veterans Memorial Park Tuesday, September 11, 2012 in McHenry. 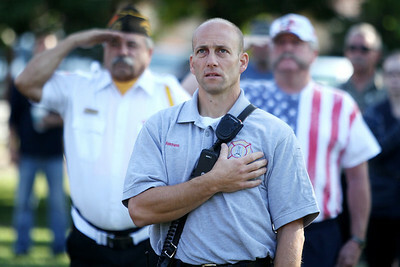 The ceremony included the raising of a flag that flew across the street from where Tower 2 of the World Trade Center stood and a moment of silence at 9:05 a.m. marking the time when the South Tower collapsed. 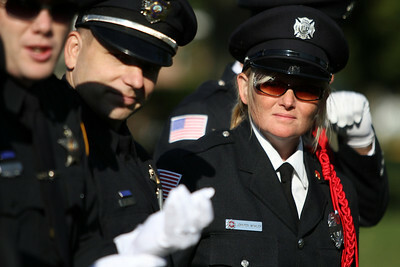 Mike Greene - mgreene@shawmedia.com McHenry Township Fire Protection District Honor Guard commander Jenny Winkler listens to instructions Tuesday, September 11, 2012 before the start of a 9/11 ceremony at Veterans Memorial Park in McHenry. The ceremony included the raising of a flag that flew across the street from where Tower 2 of the World Trade Center stood and a moment of silence at 9:05 a.m. marking the time when the South Tower collapsed. 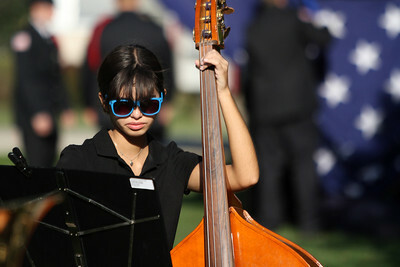 Mike Greene - mgreene@shawmedia.com McHenry High School band member Paige Wolkober, 16, practices before performing Tuesday, September 11, 2012 before the start of a 9/11 ceremony at Veterans Memorial Park in McHenry. The ceremony included the raising of a flag that flew across the street from where Tower 2 of the World Trade Center stood and a moment of silence at 9:05 a.m. marking the time when the South Tower collapsed. 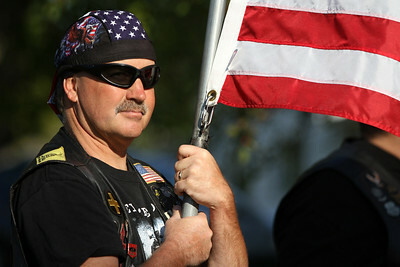 Mike Greene - mgreene@shawmedia.com Matt Charlier, of the Warriors' Watch Riders, holds an American flag during a 9/11 ceremony at Veterans Memorial Park Tuesday, September 11, 2012 in McHenry. The ceremony included the raising of a flag that flew across the street from where Tower 2 of the World Trade Center stood and a moment of silence at 9:05 a.m. marking the time when the South Tower collapsed. 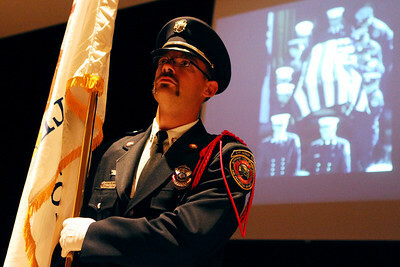 Mike Greene - mgreene@shawmedia.com Algonquin-Lake in the Hills Fire Protection District Honor Guard member Frank Pelanek stands at attention while presenting the Illinois state flag Tuesday, September 11, 2012 at Jacobs High School in Algonquin. 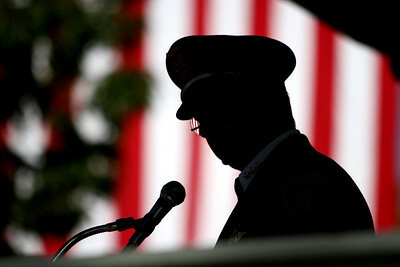 Members of local and regional fire departments spoke during a remembrance for victims of the 9/11 attack. 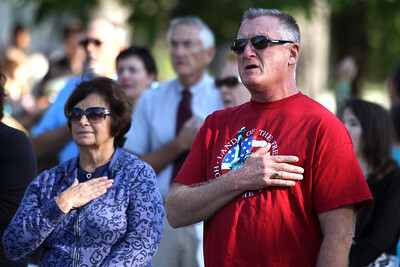 Mike Greene - mgreene@shawmedia.com Navy Veteran Larry Breidenbach, of McHenry, joins the crowd in singing the Pledge of Allegiance during a 9/11 ceremony at Veterans Memorial Park Tuesday, September 11, 2012 in McHenry. The ceremony included the raising of a flag that flew across the street from where Tower 2 of the World Trade Center stood and a moment of silence at 9:05 a.m. marking the time when the South Tower collapsed.